Members of the Impulse drum line took center court on Wednesday, May 21 performing as part of game one of the NBA Western Conference Finals at the Staples Center in Los Angeles. 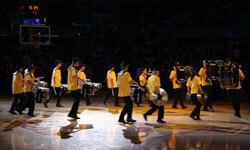 "The group had a great time entertaining the crowd and working with the Lakers staff," said Richard Rogers of Impulse. The Los Angeles Lakers defeated the defending champion San Antonio Spurs 89-85 in the game, the first of a best-of-seven playoff series. Check out a photo gallery from the event. Look for Impulse at the beginning of this clip on NBA.com.